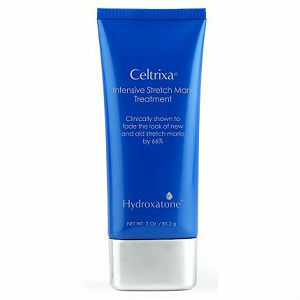 This article presents a detailed product review for Hydroxatone Celtrixa Intensive Stretch Mark Treatment. This product purports to reduce striae and striae discoloration on the stomach, hips, breasts, and thighs. It also reduces the depressions caused by stretch marks and improves elasticity while smoothing and softening the tone of your skin. Your will learn more about this lotion as your read the rest of this review. Vanistryl- a mixture of many active ingredients that target existing striae and prevent new striae. Matrixyl 3000- supports and promotes regenerative skin properties. It renews your skin’s pliability and strength. This ingredient also stimulates the production of collagen. Marine Filling Spheres- provides quick and long-lasting hydration to keep your skin healthy. Milk Peptide Complex- helps in maintaining a resilient and strong skin. It also increases the production of hyaluronic acid, fibronectin, and collagen, which play a significant role in skin regeneration. Soft Focus Effect- improves even the darkest and deepest striae. Vitamin E, A, and E- Vitamins with important antioxidant properties. Clean the affected areas of the skin and apply the lotion two times a day. Use circular motions to massage uniformly and gently until the lotion is completely absorbed. Concentrate on areas where striae are likely to occur. Apply onto both old and new stretch marks. Note that this product should be used externally. Moreover, avoid direct exposure to the eye. In case of ingestion, consult a doctor or call the relevant agency immediately. This product claims to be risk-free meaning that there are no side effects. The price of one tube (85.2 g) is $79.95 on the manufacturer’s site. This is a relatively high price for a tube of this size. We did not find any price discounts. The manufacturer claims that 100 percent of clinical study participants showed a significant decrease in the appearance of striae. The manufacturer has provided a 30-day money-back guarantee to prove that this product is an effective treatment for stretch marks. We also did research on the experiences of people who have used this stretch mark lotion. Our findings show that there are both satisfied and dissatisfied users. However, the number of satisfied users is slightly higher than the number of unhappy users. Although there are some positive customer reviews, many negative reviews are likely to reduce the confidence of some potential buyers. There is no doubt this product is a blend of powerful ingredients that can help in combating striae. The advantages of this lotion include a satisfaction guarantee and the use of risk-free ingredients. However, the product’s high price and a significant number of negative reviews are major drawbacks. The lack of price discounts is also a limitation. David Carney	reviewed Hydroxatone Celtrixa	on August 15th	 and gave it a rating of 3.